A new edition for 2019, the Jag is a slalom board set free from the racecourse. As a special release for the 2019 range, the all new Stingray is a dedicated windsurfing foil board with an incredibly easy and fun character. Arriving at Lake Annecy it was cloudy and cold, but the forecast looked very promising, no wind and sun! Stand a chance to win a Starboard All Star SUP by simply posting your favourite Winter SUP picture! He just gets better and better. We don't always think about it, but there's one thing we all want from a fishing trip - to come home safely to our friends and family with wonderful stories to tell! Hosted at the Nautic Paris Boat Show at Porte de Versailles made an epic venue with an excited and animated crowd lining the a pool as racers went head-to-head. Who walked away with the jewelery on the weekend at the King Of The Cut SUP Race? 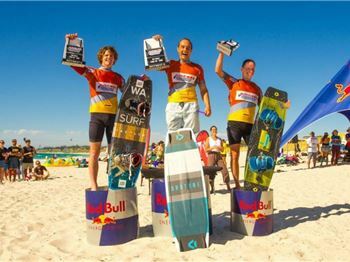 Australia's premier downwind SUP race is getting nearer. Keep reading to see how you can get involved. Simon Bornhoft returning to Perth & Lancelin In Dec 2018 Last places for Windwise Freeride & Freewave sessions If you're looking to give your windsurfing a really big boost then grab one of the last places on these proven Windwise coaching sessions! Situated in Cape Range National Park, Yardie Creek is a spectacular site. Well about 6 years ago I set myself a goal to be able to play by the time I'm 50.